Bullying is not consistent with the Victorian Public Sector Values or Employment Principles. It is harmful to our employees, and undermines our work delivering world class services to Victorians. Bullying is an issue of significant concern for all workplaces. Data from across the Victorian public sector shows it to be a sustained, and on-going, problem, despite the best efforts of public sector agencies. However, that same data also shows that organisations can change, when they focus on improving workplace culture and managing poor behaviours. 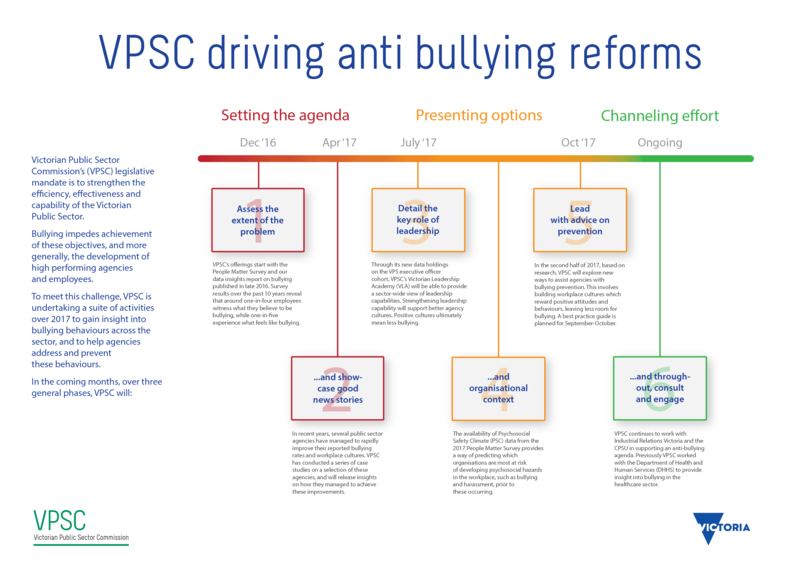 VPSC has identified a program of activities for 2017, to gain insight into bullying behaviours across the sector, and to help agencies address and prevent them. Assessing the extent of the problem.. The People Matter Survey (PMS) seeks the opinion of public sector employees on a range of issues including workplace culture, employee engagement and job satisfaction. VPSC uses multiple years of survey data to analyse trends in workplace culture. As has been reported, the rate of poor behaviour has not significantly improved over time, despite the best efforts of agencies. The rich PMS data allows VPSC to look deeper into the problem and consider causes. Identifying causes and indicators then enables us to develop early intervention strategies; preventing poor behaviour before it becomes a big issue. PMS also identified a number of public sector agencies that have experienced a signification reduction in employee perceptions of workplace bullying over a 5 year period. Positive outcomes like this show that change in organisations is possible, and demonstrate the value of the PMS in surfacing issues that organisational leaders can tackle. The case studies demonstrate that while workplace bullying can come in many different forms, there are a number of common approaches that have been successfully employed to help turn the tide on bullying in the workplace and improve workplace cultures.